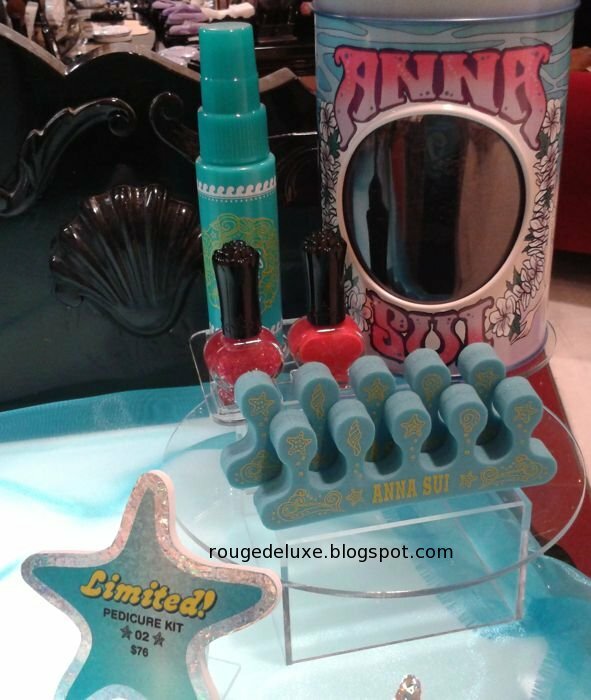 The Anna Sui Glittering Mermaid beach collection launches tomorrow (Friday) at Isetan stores and the testers were already on display at Isetan Orchard today. The Double Eye Colors are S$39, the Eye Makeup Sets are S$58 each and the Pedicure Sets S$76 each. 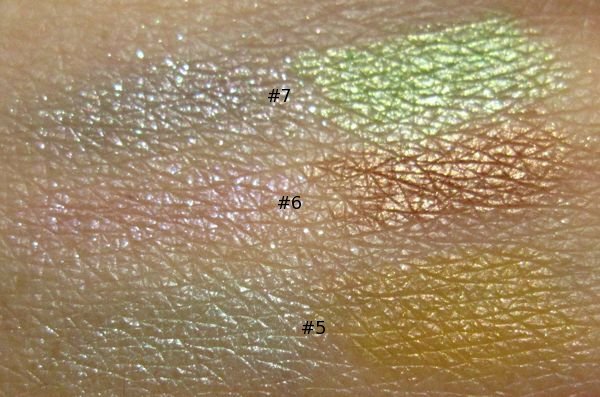 Below are swatches of the Glittering Color from the Eye Makeup Sets #1 (left) and #2 (right). 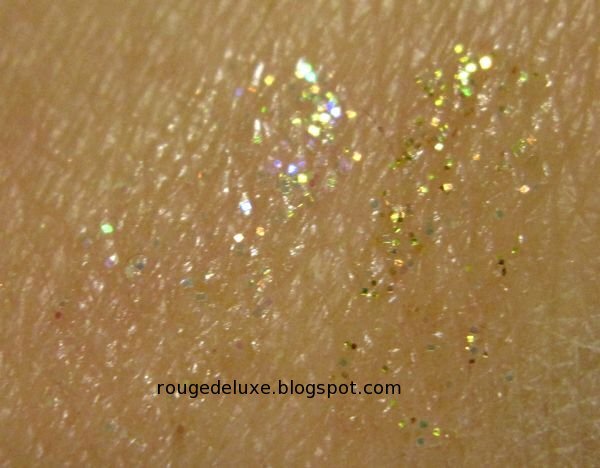 These come with a sponge doefoot applicator and basically show up clear with a smattering of glitter. 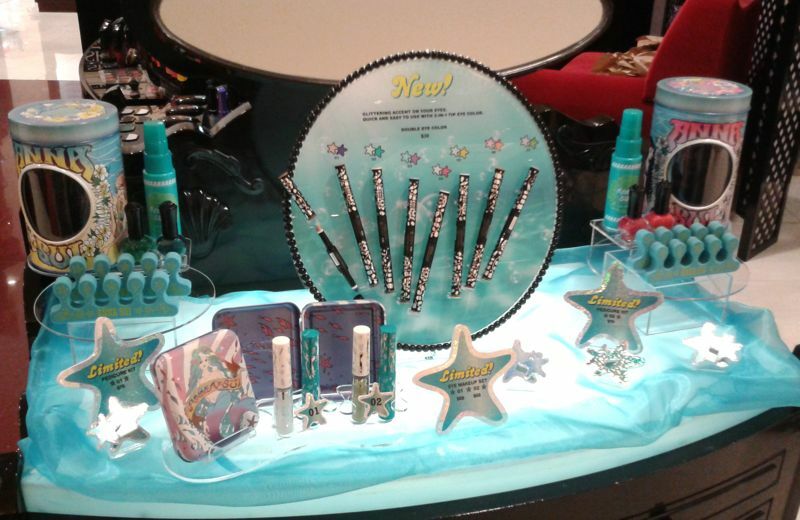 They can be used either as mascara or eye colors. The nailpolishes in the Pedicure Sets are lovely vibrant shades but given the relatively high price of the Pedicure Sets, I wish that the nail polishes were full size instead of just 5ml (half of the regular size) each. 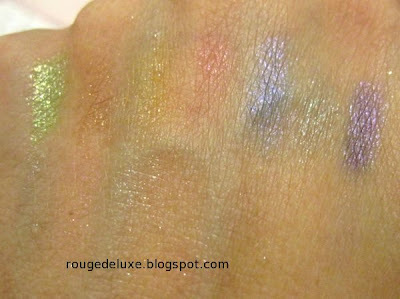 Here are swatches of the Double Eye Colors, which contain 0.8g of product each. These have sponge applicators that you dip into the tiny pots inside the end caps. 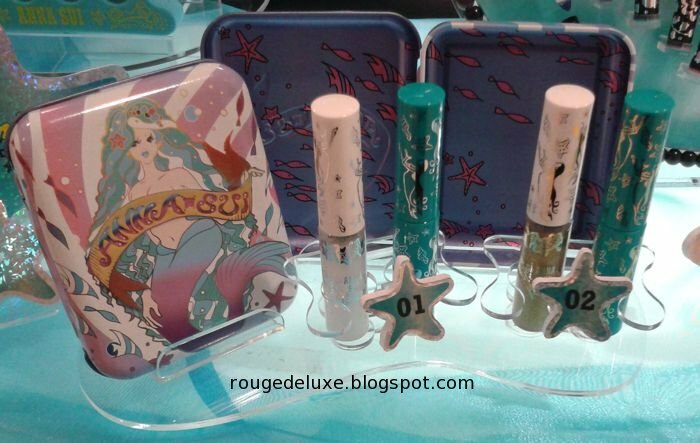 Each Double Eye Color has a very shimmery icy shade paired with either a bolder metallic or a satin shade. The photo below was actually taken 7 hours after I did the swatches with my camera, as I had left my camera at home. 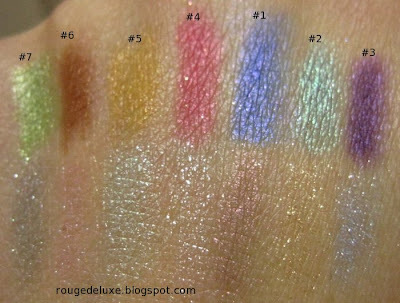 By then, the bottom row of more shimmery shades had faded somewhat. The swatches were done without any primer or base underneath. Most of the shades had good colour payoff. 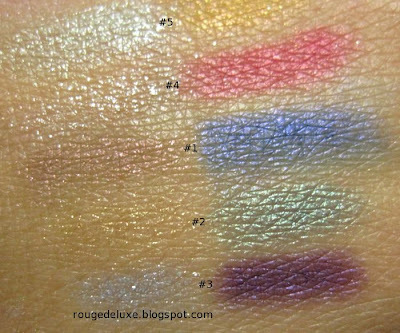 There are a number of unusual shade combinations in the line-up like #1 which is a bold metallic blue paired with a gorgeous mauve with pink shimmer, reminiscent of MAC Trax (the swatch had faded quite a bit by the time I took these photos and it's much prettier in real life). I also liked the metallic royal purple of #3. 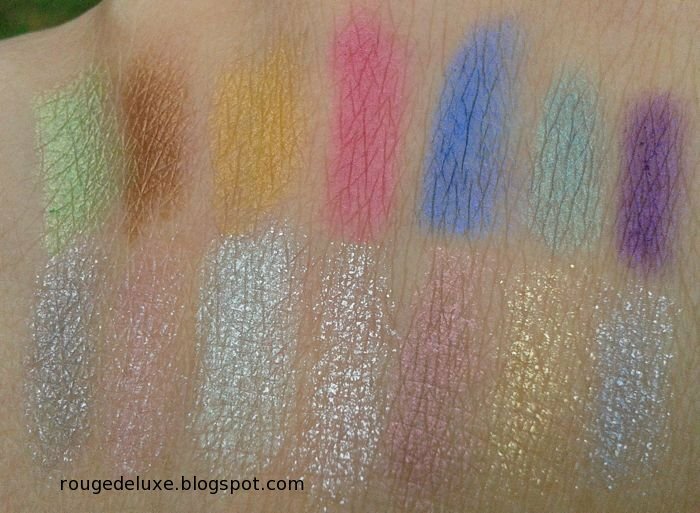 The photo below was taken shortly after I did the swatches with my Samsung Galaxy Ace phone. It shows more accurately the high shine nature of the shades in the bottom row, but it didn't capture the metallic and satin shades in the top row accurately. I decided to test the lasting power of the Double Eye Colors further by not removing them before my shower. After the shower, I also washed my hands with a Lush soap. I was impressed that some of the metallic shades actually lasted through both the shower and handwashing. 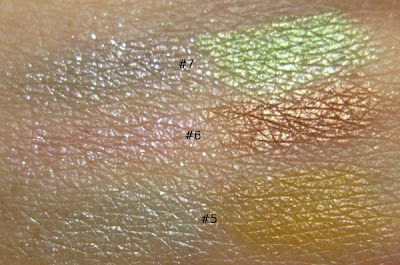 The more shimmery shades had all disappeared while the metallic light leaf green and royal purple shades lasted the best. Very 美美! Thanks for the sneak peek earlier; they looked very pretty on the back of your hand. Thanks for the awesome sneak peek photos. The colors are bright, just in time for spring. They remind me a bit of NYX colors in a way. NIce~ I like the eyeshadow! Would need to check them out when I go to town! I just dropped by today and picked up the mascara for length (red) and the pedicure kit in pink to utilize my birth month bonus points! $76 is pricey, but the packaging is so beautiful, and i was told by Scotts that they only brought 120 pieces into Singapore.